All Diamonds Are Not Created Equal! Let us help you pick the perfect diamond! When it comes to determining a diamond's quality and value, there is a universally accepted standard know as the "Four C's": Carat, Cut, Clarity and Color. These "Four C's" must all be considered when purchasing the right diamond. Two diamonds of equal carat weight may vary substantially in price due to their Cut, Clarity and Color. But keep this in mind: bigger isn't necessarily better. A two-carat diamond that is cut poorly is not nearly as beautiful as a smaller diamond cut by a skilled diamond artisan. Or, it may be cut well, but have poor color and clarity. To be exceptionally beautiful, a diamond must be of high quality in all Four C's. Within seconds you will know whether a diamond is right for you. 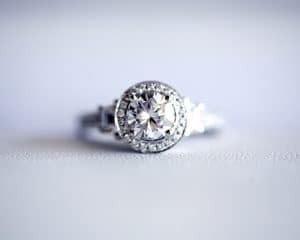 We believe that your perfect ring should reflect who you are or who she is. We feel strongly that your inital emotional response to the brilliance and style of a dimaond is of theutmost omportance in choosing your diamond. Browse our wide array of elegant styles and select a diamond ring that represents your love and commitment. We are here to help you every step of the way. A diamond's weight is determined by carat weight. One carat is divided into 100 "points" so that a diamond of 25 points is described as a quarter of a carat, or 0.25 carats. Size is only one factor in determining the value of a diamond. Of The Four C's, carat weight is the easiest to measure. A carat weight measures the weight of a diamond. People commonly refer to the shape of a diamond as the cut (round diamonds, princess cut diamonds, marquise cut diamonds, oval diamonds, pear-shaped diamonds, emerald cut diamonds, radiant cut diamonds, heart-shaped and Asscher cut diamonds). But cut really is the craftsmanship applied in cutting the facets of the stone. The artisan attempts to cut a diamond to make the best use of light. When a diamond is cut to good proportions, light is refracted from one facet to another, then dispersed through the top of the diamond. When a diamond is cut too deep, some light escapes through the opposite side of the diamond. If the diamond is cut too shallow, light escapes through the bottom of the stone before it can be reflected. In addition, the facets must be placed with precise symmetry for maximum brilliance. Cut is perhaps the most important of The Four C's to consider. A well cut diamond – regardless of its shape, sparkles, has more fire and offers the greatest brilliance. Clarity is an indication of a diamond's purity. When a rough stone is extracted from carbon, deep beneath the earth, tiny traces of natural elements are almost always trapped inside. These elements are called inclusions, though sometimes referred to as birthmarks, because they are formed naturally and are unique to each stone. Because most inclusions are not visible to the naked eye, a jeweler will use a magnifier known as a loupe to reveal a diamond's inclusions. Color is the natural body color visible in a diamond and is the one C determined completely by nature, not man. As a rule, the closer a diamond is to colorless, the more valuable and beautiful it is. Diamond colors appear in a range. Color grades D, E and F are considered colorless, making them rare. However, even more rare than the colorless are the fancy colored diamonds. These diamonds are beyond the Gemological Institute of America (GIA) color scale. There are well defined colors that include pink, canary yellow, blue and green…highly priced, extremely rare, major showpieces! Fluorescence is the visible light some gemstones emit when they are exposed to invisible ultraviolet (UV) rays. In natural diamonds blue is the most common color of fluorescence, but other colors may be visible. On a GIA Diamond Grading Report fluorescence refers to the strength, or intensity, of the diamond’s reaction to long-wave UV, which is an essential component of daylight. To learn more about diamond fluorescence visit GIA. Yes. Of the diamonds submitted to GIA over the past decade, approximately 25% to 35% exhibit some degree of fluorescence. However, only 10% of those show strengths of fluorescence that may impact appearance (i.e. strengths noted on laboratory reports as medium, strong or very strong). In more than 95% of the diamonds that exhibit fluorescence, the color seen is blue. In rare instances, the reaction is yellow, white or another color. GIA studies show that for the overwhelming majority of diamonds, the strength of fluorescence has no widely noticable effect on appearance. In many instances observers prefer the appearance of diamonds that have medium to strong fluorescence. In rare cases, some diamonds with extremely strong fluorescence may appear hazy or oily; fewer than 0.2% of the fluorescent diamonds sumbitted to GIA exhibit this effect.